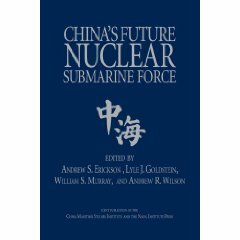 Andrew S. Erickson, Lyle J. Goldstein, William S. Murray, and Andrew R. Wilson, eds.,China’s Future Nuclear Submarine Force (Annapolis, MD: Naval Institute Press, 2007). Reprinted in Chinese as [美] 安德鲁·S·埃里克森 [Andrew S. Erickson], 莱尔·J·戈尔茨坦 [Lyle J. Goldstein], 威廉·S·默里 [William S. Murray], 安德鲁·R·威尔逊 [Andrew R. Wilson], (编者) [Editors]; 刘宏伟 [Liu Hongwei] (译者) [Translator]; 中国未来核潜艇力量 [China’s Future Nuclear Submarine Force], 海洋战略与海洋强国论丛 [Maritime Strategy and Maritime Great Power Forum Series], 十二五国家重点出版物出版规划项目 [Twelfth Five-Year Guideline State Key Publications Planning Initiative], (Beijing: 海洋出版社 [Ocean Press], 2015). Authorized Chinese-language edition published in 2015 by China Ocean Press (www.oceanpress.com.cn). and, with Andrew Wilson, of “China’s Aircraft Carrier Dilemma,” 229-69 (中国的航空母舰困局, 201-15). These and several other chapters are required reading for the Naval War College Strategy and Policy Department’s Senior and Intermediate Leadership Courses. Volume cited in Wikipedia’s “Type 094 Submarine” entry. [美] 安德鲁·S·埃里克森 [Andrew S. Erickson], 莱尔·J·戈尔茨坦 [Lyle J. Goldstein], 威廉·S·默里 [William S. Murray], 安德鲁·R·威尔逊 [Andrew R. Wilson], (编者) [Editors]; 刘宏伟 [Liu Hongwei] (译者) [Translator]; 中国未来核潜艇力量 [China’s Future Nuclear Submarine Force], 海洋战略与海洋强国论丛 [Maritime Strategy and Maritime Great Power Forum Series], 十二五国家重点出版物出版规划项目 [Twelfth Five-Year Guideline State Key Publications Planning Initiative], (Beijing: 海洋出版社 [Ocean Press], 2015). China Ocean Press published an authorized Chinese-language edition in 2015.
and, with Andrew R. Wilson, of “China’s Aircraft Carrier Dilemma,” 229-69 (中国的航空母舰困局, 201-15). The trajectory of Chinese nuclear propulsion for submarines may be one of the best single indicators of whether or not China intends to become a genuine global military power. Nuclear submarines, with their unparalleled survivability, remain ideal platforms for persistent operations in far-flung sea areas and offer an efficient means for China to strengthen deterrence and project power. 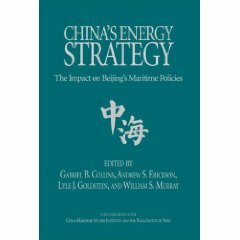 This collection of essays presents the latest thinking of leading experts on the emergence of a modern nuclear submarine fleet in China. Each contribution is packed with authoritative data and cogent analysis. The book has been compiled by four professors at the U.S. Naval War College who are co-founders of the college’s China Maritime Studies Institute (CMSI). Given the opaque nature of China’s undersea warfare development, readers will benefit from this penetrating investigation that considers the potential impact of revolutionary changes in Chinese nuclear submarine capabilities. 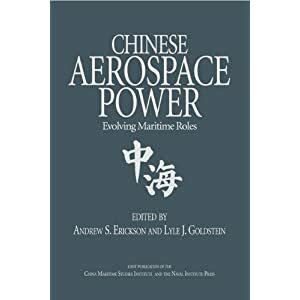 This book is essential reading for everyone interested in China’s foreign and defense policies; in the future of the U.S. Navy; and in the defense of the United States. 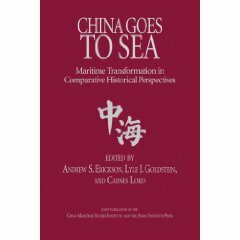 This is the first book in the series “Studies in Chinese Maritime Development” published jointly by the China Maritime Studies Institute and the Naval Institute Press. –Amb. Chas. W. Freeman Jr., Chairman, Projects International, Inc.
—Capt. Giles Van Nederveen, USAF (Ret. ), Strategic Studies Quarterly 4.1 (Spring 2010). –Scott W. Bray (the U.S. Navy’s Senior Intelligence Officer for China), “Turning to the Sea… This Time to Stay,” Book Review Essay, Asia Policy 9 (January 2010): 167-72. — L. H. Xavier Demián Soto Zuppa, El Colegio de México, A.C., Centro de Estudios de Asia y África (CEAA), China Review International, 16.4 (2009): 494-501. –Lt. Col. John D. Becker, USA, Joint Force Quarterly Vol. 52, No. 1 (2009): 165-66. –Colin Green, Pacific Affairs 81.1 (Spring 2008): 111-13. –Alan Wachman, Naval War College Review 61.2 (Spring 2008): 134. –Richard Scott, “China’s Submarine Force Awaits a Cultural Revolution,” Jane’s Navy International, 1 January 2008. –Gregory R. Copley, “The Pacific Turns a Pinker Hue,” Maritime Studies 156 (September/October 2007): 24-25. —LCDR Youssef Aboul-Enein, USN, Naval District Washington, DC, 10 May 2007.